To evaluate the usefulness of FDG PET/CT to differentiate malignant endobronchial lesions with distal atelectasis from benign bronchial stenosis. This retrospective study reviewed 84 patients who underwent contrast-enhanced chest CT and then PET/CT and had histological (n = 81) or follow-up imaging (n = 3) confirmation. Two chest radiologists reviewed initial chest CT and determined endobronchial lesions to be malignant or benign. Two nuclear medicine physicians reviewed PET/CT for FDG uptake at the obstruction site and measured SUV. Malignancy was considered when increased FDG uptake was seen in the obstruction site, regardless of FDG within the atelectatic lung. 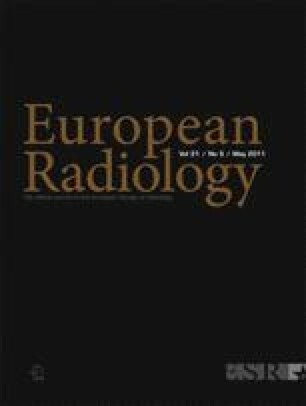 The sensitivity, specificity and accuracy of chest CT was 95%, 48% and 84%, compared with 95%, 91% and 94% for PET/CT. Benign obstructive lesions showed statistically lower FDG uptake than malignant obstructions (benign SUV 2.5 ± 0.84; malignant SUV 11.8 ± 5.95, p < 0.001). ROC analysis showed an SUV cut-off value of 3.4 with highest sensitivity of 94% and specificity of 91%. Increased FDG PET/CT uptake at the obstruction site indicates a high probability of malignancy, while benign lesions show low FDG uptake. Careful evaluation of FDG uptake pattern at the obstruction site is helpful in the differentiation between benign and malignant endobronchial lesions.